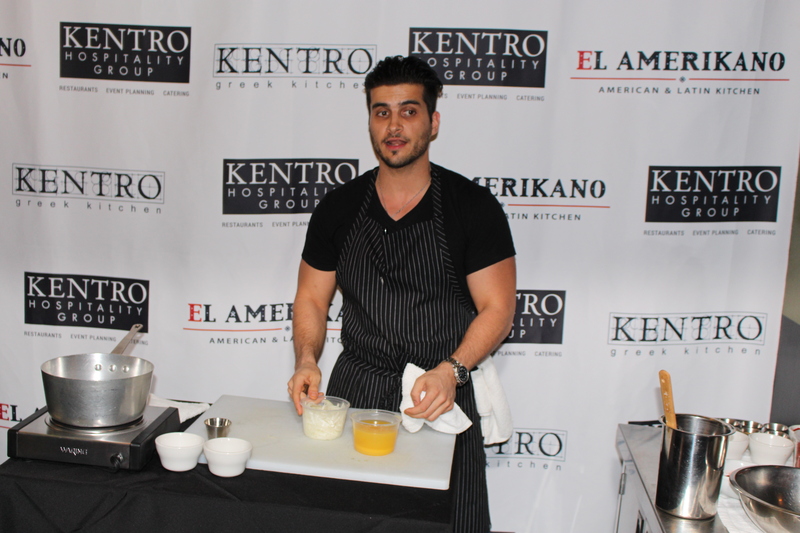 We were invited to sample a cross section of items from the menu, and the common thread running through each is the use of a variety of ingredients, many of them house-made, melded to create texture, interesting flavors and eye-catching dishes. Cucumber Cevice. 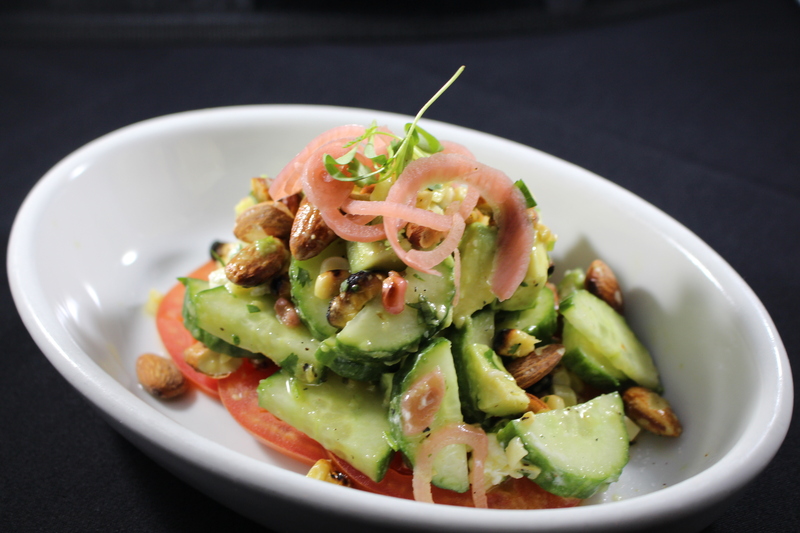 This salad offers a light refreshing start to your meal with cucumber, avocado, almonds, tomato, shallots, and goat cheese as well as roasted corn lending a smoky rustic note. Warm Mushroom Salad. 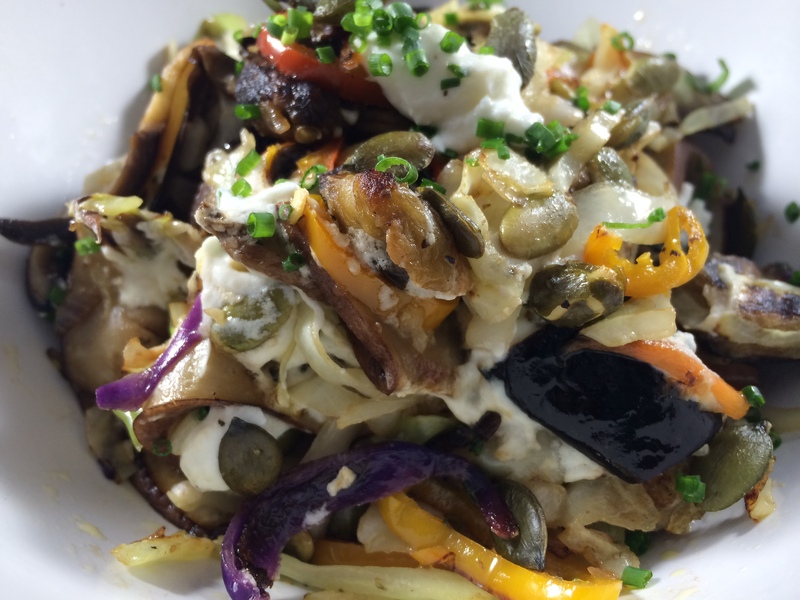 This salad is a visual and textural delight with shredded cabbage, eggplant, goat cheese, pepitas, sweet peppers, chili pepper, onion, and garlic. Mole Eggplant. 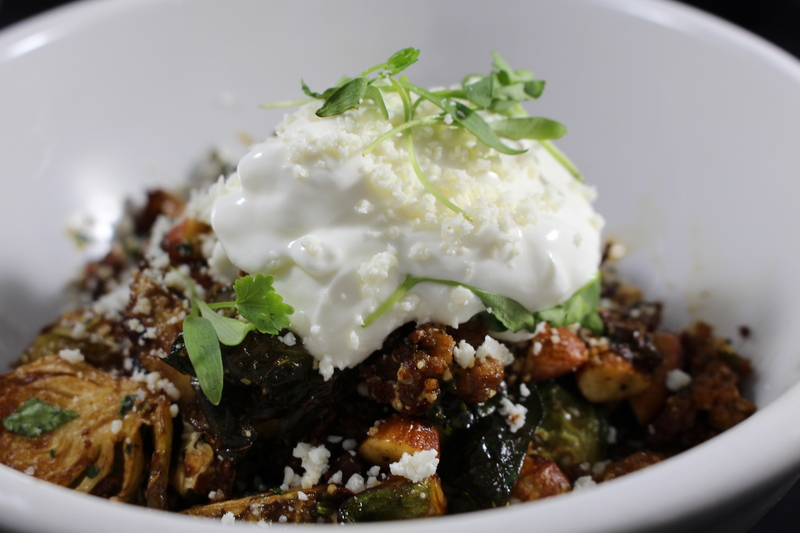 Though I’m not personally a fan of the texture of eggplant, the deep flavor in this dish more than compensates. 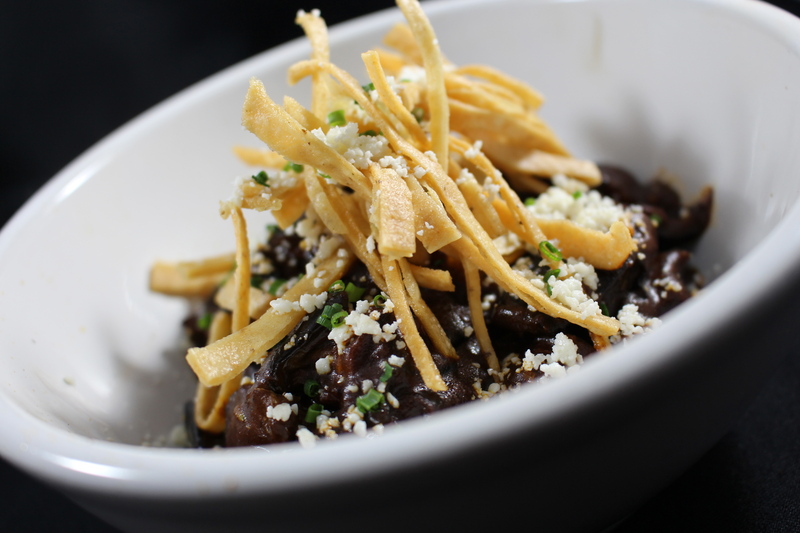 Accented with two dried chiles and guajillo, cotija cheese, and chives along with shredded crispy corn tortillas. This is another dish with contrasting texture. Brussels Sprouts. Easily one of my two favorites this evening, this flavor explosion features chorizo with almonds, cotija cheese, and jalepeno sprinkled in. 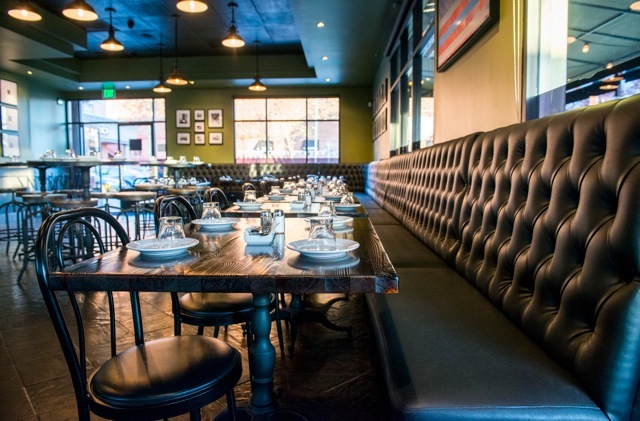 Crema fresca rounds out the pronounced spicy and savory flavors. Al Pastor Chop. 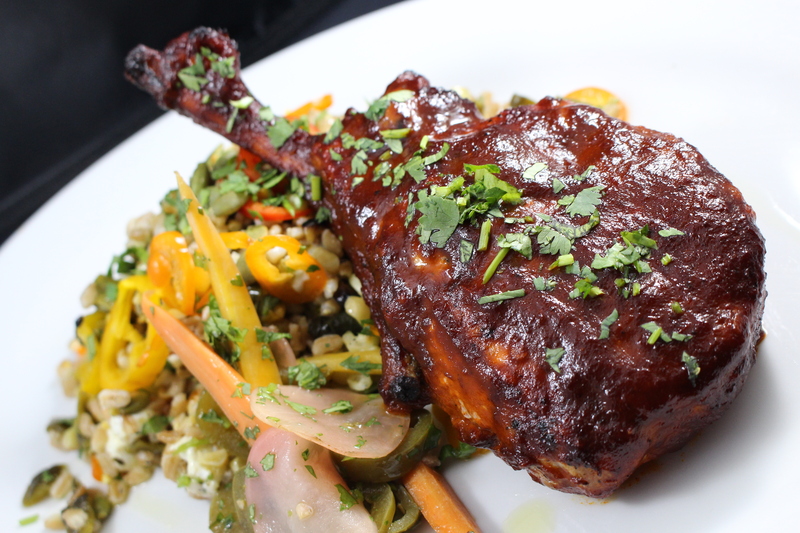 This pork chop, stars Chef Konstantine’s house-made al pastor glaze and a bed of spicy farro salad with corn, and a house-made jalapeno vinaigrette with poblano chilies and sweet peppers. And the final dish, Chef Konstantine’s signature Asada Brava char grilled rib eye featuring his own house-made Latin rub. 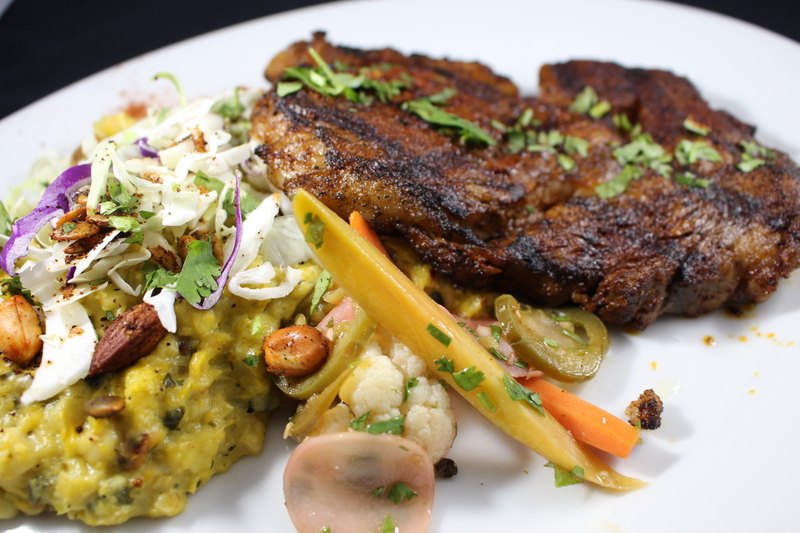 Perfectly grilled, this tender, juicy, smoky rib-eye is served with creamed corn with poblano, nuts, cumin, oregano, and cheese. The atmosphere in the moderately priced El Amerikano is casual and inviting and includes an outdoor patio area strung with lights. Wines by the glass, carafe and bottle are served along with a selection of bottled and draft beers. 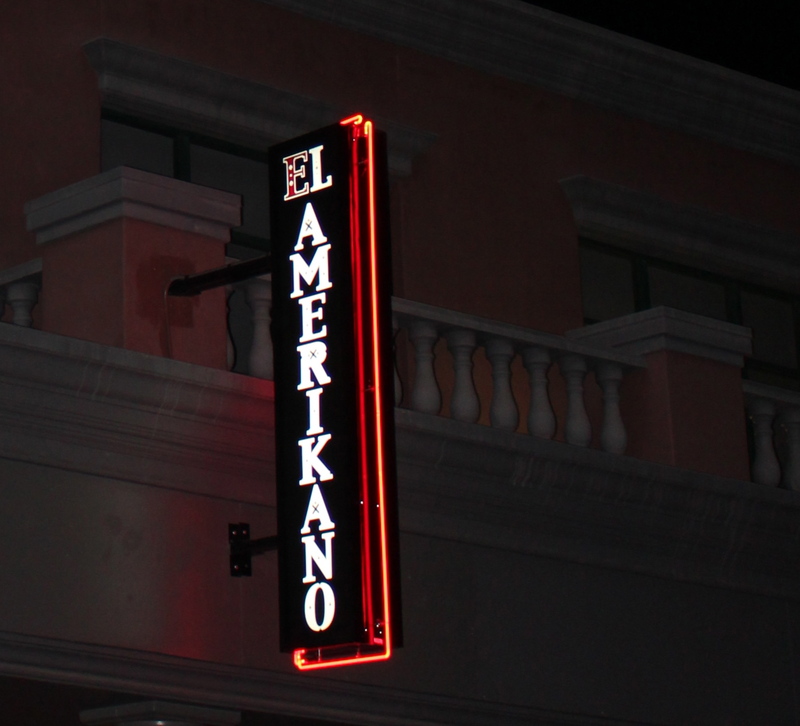 El Amerikano is located at 100 South Harbor Blvd in Downtown Fullerton near the train station and is open daily 11 a.m. – 10:00 p.m.